Preheat oven to 450. Oil or spray a medium baking pan. Place tempeh in a medium saucepan with enough water to cover, bring to a boil, reduce heat, and simmer, covered, for ten minutes. Remove from heat and drain well. Brush both sides of tempeh with tamari and place in prepared baking pan. Bake for 15 minutes, turn tempeh over, and bake 15 minutes more. Remove from oven and set aside to cool. In a large bowl, mix together mayonnaise, lemon juice, mustard, and celery seed. Add prepared vegetables and mix well. 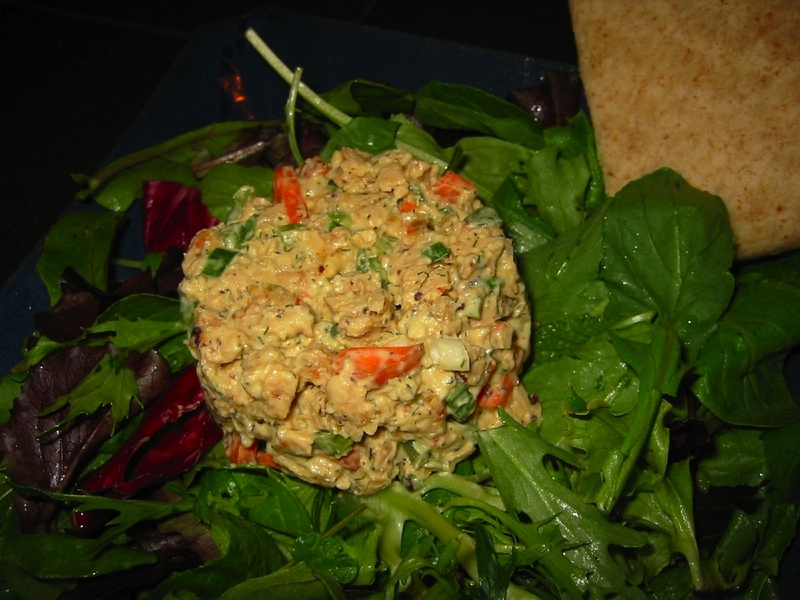 In a food processor, pulse tempeh until it has a tuna-like consistency. (Or mash with a fork.) Add tempeh to vegetables, season with salt and pepper, and dill if desired. Enjoy as you would any “tuna” salad, on a sandwich, with lettuce, in a tomato, or just as is.